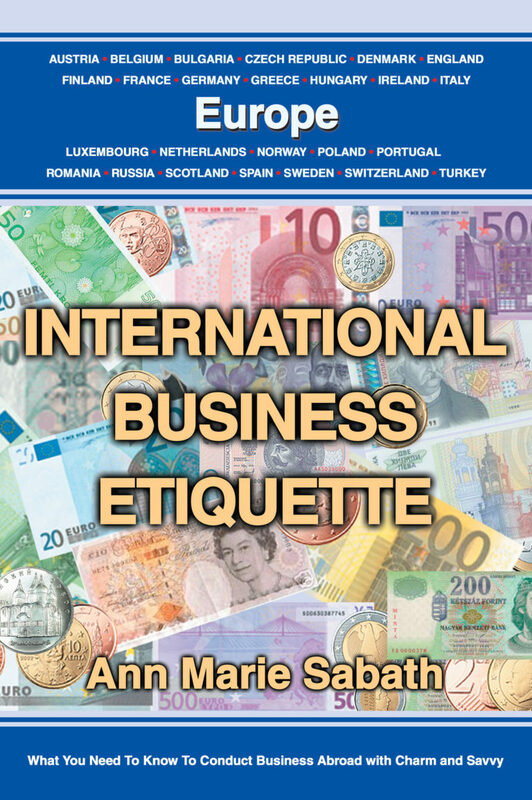 International Business Etiquette: Europe shares the do's and don'ts of interacting with individuals in every country throughout Europe. Each of the 25 country-specific chapters begins with a summary of statistics. What follows are countless tips about what to do and when to do it, whether you are interacting with your international client for the first time or the fourth time. Each chapter closes with "Whatever You Do...Don't" tips for avoiding the most commonly made faux pas for both business and leisure travelers. Cards should be exchanged with new business acquainted following your initial handshake and greeting. Be sure to present your card to the most senior person first as a gesture of respect. You may find that the typical French business card is larger than the standard American card. Be sure to acknowledge any card you receive with a word of thanks before placing it in your wallet or portfolio. German meeting manners dictate that you arrive at the exact appointed time. You will know that a meeting is about to begin when the doors of the room are closed. If you are hosting a meeting, be sure to see to it that the doors are closed before you begin the meeting. If you don’t, Germans may see it as an invasion of privacy. A typical meeting with Germans will be formal in its approach. You will not find any kibitzing taking place. After beverages are served, the person spearheading the meeting will get right down to business. Even though the Germans present may have a command of English, it will be in your best interest to have your presentation material translated into German. The German temperament is something that you will want to understand in order to make your business relationship move smoothly. For instance, it will be important to remember that Germans value structure, and they will expect it from you in both your verbal and written presentations to them. In addition, this nationality is cautious by nature and not very risk-oriented, so you will find it in your best interest to lay the facts on the table in a very methodical manner in order for them to give your proposal serious consideration. Whatever you do, avoid giving your German colleagues information in a “by-the-way” manner. Besides making them uncomfortable with this lackadaisical approach, you may lose your chance to develop a long-term relationship with them. You can count on your German associates to be thorough in their approach to conducting business and their attention to detail. As a result, their finished products (Mercedes or BMW automobiles, for example) are noted for being of the highest quality. In turn, they expect the highest performance from you. For clarification’s sake, make sure that whatever you present includes documentation in German. This not only demonstrates consideration for your German associates, but it is also wise because the individuals in attendance may share your information with the managing director of the organization who will have the final decision-making authority. Finally, recognize that Germans move slowly yet surely. For that reason, expect a business relationship with a German to take time.